Amy Klobuchar, Possible Presidential Candidate, One of Congress's 'Worst Bosses'? Amy Klobuchar, Possible Presidential Candidate, One of Congress’s ‘Worst Bosses’? A potential Democratic candidate for president is ranked among one of the "worst bosses" on Capitol Hill, according to staff turnover data compiled by government tracking site Legistorm. Sen. Amy Klobuchar (D., Minn.) on Tuesday morning indicated on two separate occasions that she may be moving closer to jumping into the Democratic field for president in 2020. Klobuchar told NPR's Steve Inskeep that she would be "going south for the winter" when asked if she would be headed to Iowa. Additionally, the Minnesota senator announced the "big news" that her family is on board for a possible presidential run. "Big news today, my family is on board including my in-laws, so showing momentum," Klobuchar said on "Morning Joe." "But I'll make this decision on my own course regardless of what other candidates are doing." Klobuchar, who has been described as "Minnesota nice" in public settings, has consistently had one of the highest staff turnover rates in the Senate. An index of past Klobuchar staff shows that since she was first elected to the Senate in 2006, around 200 individuals who have worked in her offices have departed. The Legistorm staff turnover data, compiled in a feature called ‘Worst Bosses? ', is calculated using official salary disclosures. Members of leadership are excluded from the lists, and only full-time, non-temporary staff are used as part of its data set. The formula used to determine staff departure additionally weighs the departure of senior level staffers higher than those of lower level staffers. "As such, the departure of a $150,000-a-year chief of staff will have five times the impact on the turnover index as the departure of a $30,000-a-year staff assistant," Legistorm says. 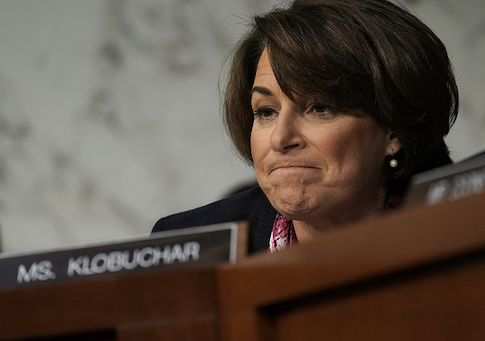 The data compiled by Legistorm showed that from 2001 to 2016, Klobuchar's annual turnover rate of 36 percent was the worst in the Senate, Politico previously reported. The most recent data on the site, which covers 2001 to 2017, put Klobuchar's annual turnover rate at 35 percent, ranking the office as the third-highest rate during the time period. However, the top two ranked senators for 2001 to 2017—Sen. Chris Van Hollen (D., Md.) and Sen. John Neely Kennedy (R., La. )—were both elected to Congress's upper chamber in 2016, providing a much smaller sample size. Legistorm notes that for "short periods of time like a single year can make such measurements particularly unreliable. In single years, members might be hit by bad staffing luck or need a change in strategic focus caused by outside events." "Offices with the most staff turnover might also include some of the worst bosses," Legistorm writes of its lists. "Some members of Congress get a reputation for being hard to work for, whether due to anger management, shady ethics, poor pay, demanding too much or creating a toxic work environment." "Whatever the reason, the resulting office dysfunction can lead to high turnover, helping to make a member of Congress more ineffectual. One possible side-effect of high turnover is making an office less responsive to constituents while being more dependent on lobbyists for advice." Klobuchar's office did not respond to requests for comment on Legistorm's ‘Worst Bosses' list or its high turnover rates. This entry was posted in Politics and tagged 2020 Election, Amy Klobuchar, Congress. Bookmark the permalink.